While opportunities abound for anglers to target many species in our Natural North Florida area in January, it’s the thought of big sheepshead that really gets local folks excited. Cold winter weather sparks the natural spawning cycle of sheepshead and the big females, some as large as ten pounds, school over and near artificial and natural structure. While the smaller of the species are notorious bait-stealers, these larger fish are relatively easy to catch–once found. The Cedar Key area, in part due to its proximity to deep clean water than any other port along the Big Bend, offers access to the breeding grounds of some huge sheepshead. Not necessarily close to shore, nor places you’d like to run in a small skiff as a January cold front approaches, Cedar Key’s sheepshead spots are worth the trip if you’re in the mood for some of the best eating fish from the Gulf. Spawning sheepshead are attracted to structure, and one of the most popular is the Steel Tower (N28 58.515 W83 09.241), located at the end of Seahorse Reef, south of Cedar Key. It’s a 5 nautical-mile run from the municipal boat ramp to the #1 marker in the Main Ship Channel, and then another 7 miles to the tower. This navigational structure (Meaning you’re not supposed to tie up to it!) sits atop the reef in 8-feet of water and can often attract hundreds of ‘lunker’ sheepshead during the cold-weather spawning period. There are other chunks of natural bottom, including The Pit (N28 52.317 W83 07.713), seven to ten miles south of the Steel Tower in less than 40-feet of water. And there are artificial reefs that hold sizeable schools of sheepshead, including the ones built by the Gainesville Offshore Fishing Club. GOFC Reef #1 (N29 07.594 W83 13.327) and GOFC Reef #3 (N29 06.841 W83 25.603) are located, respectively, 10 and 20 miles to the west of Cedar Key and are usually fished less frequently for sheepshead than the Steel Tower. Expect crowds of boats over small rocky outcrops, springs and ledges when the sheepshead begin to bite! Once found, spawning sheepshead are either aggravated into eating or enticed to eat baits such as live fiddler crabs or live shrimp. I consider aggravation a factor as sometimes sheepshead won’t eat unless surrounded by multiple baits or chummed into submission. An interesting local phenomenon is that many dock and bridge pilings are scraped clean by local anglers needing barnacles for sheepshead chum during the ‘season’. Crushed oysters or clams are also useful in getting a female sheepshead’s mind off the business of the spawn. And sometimes, like many fish species, sheepshead just won’t eat at all. Tackle for sheepshead need not be complicated. Many locals rely on a simple ‘knocker’ rig consisting of a 1 or 2-ounce egg sinker, depending on the current, rigged so that it ‘knocks’ the eye of a 1/0 or 2/0 live bait hook. I prefer a strong 3/8 or 1/2-ounce lead jig head tied to the end of a 3-foot 30# fluorocarbon leader. A stiff spinning or casting rod and modern braided line will help you feel the ‘pecky’ bite of a sheepshead. While these big fish are easier to catch than the smaller versions found closer to shore year-round, remember the rule ‘that you have to set the hook before you feel the bite of a sheepshead. A BIG Cedar Key sheepshead!!! 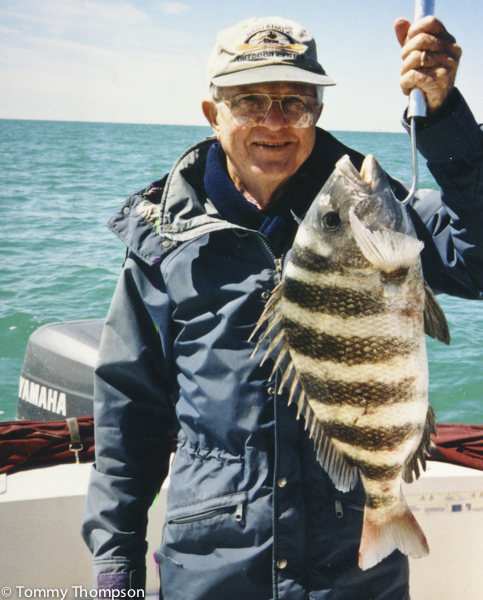 Finally, on a conservation note, be aware of what affect you might be having on the overall sheepshead population by taking a limit of these roe-laden fish. The bag limit of 15 fish per angler per day is clearly out-of-touch with current thought. And cleaning 15 large sheepshead is a daunting task even for the best electric knife-armed fish cleaners. Other Big Bend ports, like Steinhatchee and Suwannee, offer good sheepshead fishing.